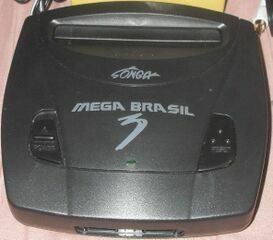 The Mega Brasil 3 is an unlicensed Sega Mega Drive console clone distributed in South America (mostly Brazil and Argentina). An extremely rare item, it appears to be based on the Genesis 3. Other than shipping with two six button controllers, very little else is known about the system.